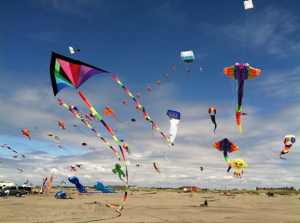 Many types of kites are manufactured every year, and some people enjoy building their kite from scratch. 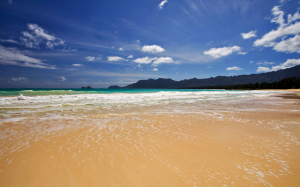 Certain kites are flown in certain wind conditions or speeds, so it is important to know. Some manufactured kites are motorized while others are made with materials which conduct electricity. It is important to know the type of kite you are planning to fly and take the necessary precautions. What are the Ideal Kites for Flying? For flying a kite, you need large, wide open spaces; so an open field is great. Anywhere in the country where there is a lot of open space to run freely and comfortably is ideal. The seashore is also great for flying kites. You have all the wind you need while having the open sea as the backdrop for your incredibly majestic kite to make all the swoops and swirls that you are hoping to be able to accomplish. It is not advisable to fly your kite in built-up areas that have homes and close to power lines, telephone cable lines, or radio towers. This is not safe, as the string attached to the kites can get entangled and you may get electrocuted. Manufactured kite strings are made with carbon which is an excellent conductor that easily attracts electricity. If ever you fly your kite, and it gets entangled in any of these wires, please seek professional help. Never try to disentangle your kite; this is not smart or safe. This is crucial, as mentioned above; you must have the ideal kite for the wind speed at hand. If the wind speed is not compatible with the kite you are planning to fly, then don’t venture out. Flying in rain and storms is also bad, as the kites will attract lightening. If flying in an open field, be sure to ask permission, especially if it is someone’s property. Be sure to look for animals as they will become spooked by the kite and become problematic, or be a danger to you and other people, even themselves. If flying with other kite enthusiasts, be cognizant of their space; if for any reason your kites get tangled, be neighbourly and work together to solve the situation. 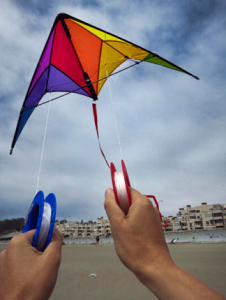 If flying a kite for the first time, you may need to take a more experienced flier along with you. There are even kite flying clubs that will be helpful in giving tips or will even assign an expert flyer to be your guide.